Child water safety is a concern for all parents. When warm weather comes, kids of all ages look forward to fun times in swimming pools, lakes and rivers. Unfortunately, the risk of drowning while having fun in and on the water is a very real threat. Opa Cove responded to the need for water safety equipment for children by releasing a line of life jackets and swim assist vests in colorful designs that children will want to wear. LoveToKnow interviewed Richard Barbis, the president and founder of Opa Cove, about his company's distinctive products. LoveToKnow (LTK): Your line includes life jackets and swim assist vests. What is difference between these two products? Richard Barbis (RB): The Life Jackets are actually United States Coast Guard approved life jackets that can be worn on a boat or used to water ski with. The life jacket puts the child in the upright position with the head out of the water. The Swim Assist Vest is a swim teaching aid requiring constant adult supervision at arm's length to the child. This product puts the child in more of the horizontal position which is the swim position, the sooner a child can feel comfortable in this position, the sooner they will learn how to swim. As well, the Swim Assist Vest may be adjusted from maximum to minimum buoyancy with removable flotation pads to suit the child's swimming ability. LTK: How does a swim assist vest help a child learn to swim? RB: See answer above. Secondly, most swim aids on the market can be embarrassing for a child to wear. Since most swim aids on the market are utilitarian looking, the child becomes a billboard to everyone at the pool that they have to wear it because they can't swim; the child understands this. Our product literally hides the panels on the inside of the vest, and thus the only thing anyone pays attention to is the child in the cute fish designed vest. LTK: Where did the idea for Sea Squirts come from? RB: The Sea Squirts life jacket came from the question, "why can't a life jacket be fun and entertaining for a child while meeting all the safety parameters required of a wary adult consumer?" Life jackets are a necessity for children unable to swim who want to play in the pool, swim in the surf, or spend the day on a boat. 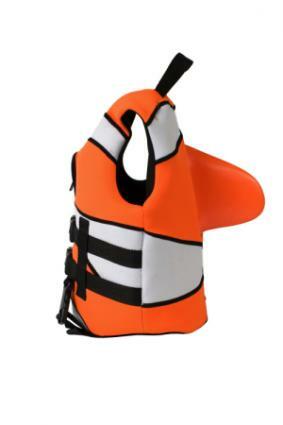 With most life jackets parents struggle with their children to keep their life jackets on. When a child wears a Sea Squirts life jacket they wear it not because they can't swim or they have to because their parents say so. They wear it because they are a "white shark", or a "clown fish" or whatever fish design they are wearing. The same logic was used when we designed the Sea Squirts swim assist vests. Most swim assist products on the market (water wings, swim belts, etc.) have not integrated learning to swim with the child's imagination like the Sea Squirts swim assist vest does. When the child wears the Sea Squirts swim assist vest, in their mind they are not wearing it because they are learning to be stronger swimmers or that it keeps them warmer in the water, but as mentioned above about the life jacket, they believe they are a "killa whale" or a "pink dolphin", etc. Thus, the Sea Squirts product line came from the idea of providing a solution that the life jacket and swim assist industry has ignored for years, namely to capture the heart of the consumer, both CHILD and adult. LTK: The Sea Squirts design includes a fin on the back of the vest. What is the advantage of this feature? RB: This is what makes the children want to wear the Sea Squirts products, because it makes them feel like a real fish. 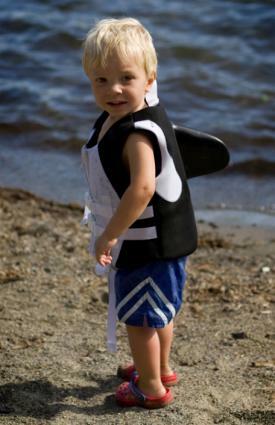 Second, the fin can be used to pull a child out of the water in an emergency situation. Note: Never lift a child out of the water entirely by the fin alone. Use both hands, one to clutch the neck of the life jacket or swim assist vest and the other hand to grab the fin. LTK: What age group/weight is the Sea Squirts line designed for? RB: Our product is designed for ages 2 thru 7 years old. LTK: What additional information/advice would you like to share with parents who are looking for water safety devices for their children? RB: Our products promote the child's creativity and their imagination. They will be lost for hours on end pretending they are a "shark" or a "pretty pink dolphin" at the pool or lake.